This week, guest blogger Molly Crabapple pops by to bring you the the Coilhouse Guide to Fashion Week During The Apocalypse. Below is Part One – In Praise of Odyn Vovk. After the jump, a quickie interview with Odyn Vovk creator Austin Sherbanenko and a Molly sketch of the Vovk afterparty. Yay! 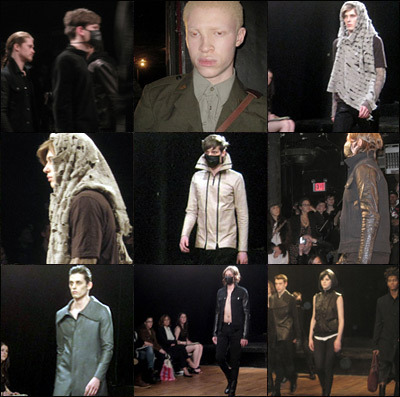 Fashion Week during our second depression is a considerably chastened affair. Alt Girl goddess Betsey Johnson ditched the tents. Celebrities are also conspicuously absent. Displays of excess don’t look so good these days. In their place are hoards of bloggers, who steal seats and swag-bags with Visigoth-style glee. On Thursday morning, I stood on line for an hour with my fellow barbarians to pick up press passes. Getting passes to Fashion Week is deliberately confusing. You register on the Mercedes Benz website, but your press badge doesn’t guarantee you entry to any shows. You have to try to talk your way into each of those individually. Fancy pants designers like BCBG and Nanette Lepore have little use for bloggers. However, being registered as press means I’m besieged with invites for Helen Yarmuk’s “FROM RUSSIA WITH LOVE- a showing of Winter White furs v Extraordinary jewels v sport luxe Separates And Exotic skin accessories.” Even more confusing? Most of the best, most innovative designers aren’t showing at Bryant Park at all. Case in point: Odyn Vovk. What’s freaky about fashion shows is how theatrical they are. They start 30 minutes late, and you make your way to the seat in pitch dark, chatting with a stylist. Then, blinding lights shoot on, live violins spring into action, and beautiful human beings, as carefully bred as greyhounds, jut their hips down a catwalk. Odyn Vovk’s clothes look like they’re from a Mad Max future where contagious diseases run rampant and people really know their leatherwork. Think dark. Think layers. Think practical basics (lots of zip-front jackets and hoodies) combined with a quixotic quest to bring back the dust mask. Odyn Vovk’s guys look the elegant and sinister, and – this is deadly rare in a fashion show – they look tough. These are zombie-slaying clothes.